I noticed the tea post link too, how funny. They do say great minds think alike so I say well done to us!! Yes thank you so much for the link, that is absolutely what I have been looking for. I will set to this weekend and get one started, keep watching for the post! There’s a similar tea selling shop in Winchester but I guess you don’t live this way. I use a steel tea infuser when making one mug that I bought in that shop but I do have a tea pot and a new tea cosy is on my to-do list. I just bought a tea infuser for myself before Christmas and it makes a lovely cuppa, the only issue is it leaks quite a few leaves, does yours do the same or have I bought a dud? I suppose it might depend on how fine the tea is but mine doesn’t. This is mine http://www.simpli-special.co.uk/empress-tea-rooms-infuser-2-piece-for-loose-leaf-tea-235-p.asp I think it is so pretty. Thanks for the link, I have ordered one so I will let you know how it goes. I’ve only just realised it’s crochet! I thought it was knitted! As that’s the case I shall start tonight. I need a crochet project. Lovely post by the way. Can’t wait to see it when it’s finished, it will look lovely on your dresser, I have made three tea cosies now and they are really quick to make so can provide a pleasant distraction if you have a big project on the go. I love it. So completely retro. I’ve always wanted to make one but my teapot only comes out of the cupboard when my parents come to stay. I’m sorely tempted to make one and have it sat on my dresser permanently. I know what you mean, I have made an effort to use the teapot recently and it does make a better cuppa. I also enjoy using tea leaves, they make a much better brew than a tea bag. I love tea cosys too! I have a bit of a tea pot obsession anyway so why not give them jackets. 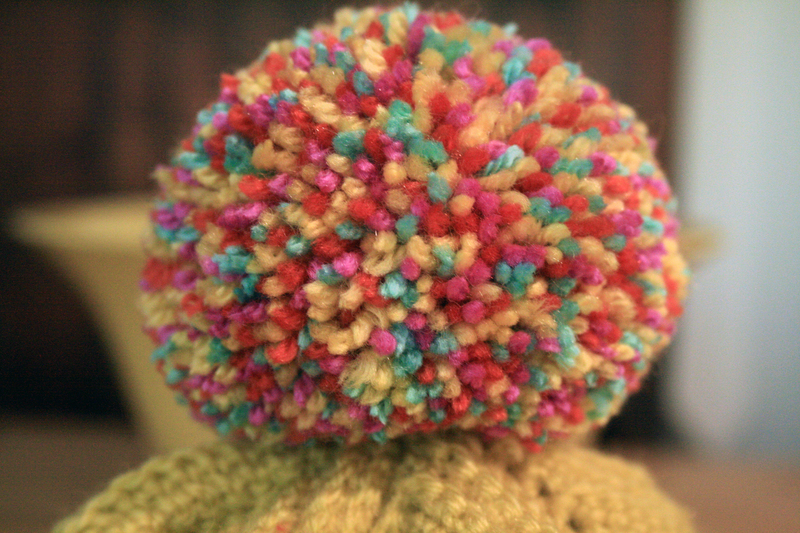 That pom pom is so lovely and round! I love the colours you have used too! I want to go make a tea cosy now! Go for it, there are lots of patterns online and so many are offered free from our lovely blogging friends. I read a lot of British mysteries and I always feel a little cheated that I grew up in the US in a family of coffee drinkers! When the going gets rough, Brits always have their tea to turn to! I love your cozy–I have a couple of old afghans made in that ripple pattern. You are absolutely right, tea is a great tradition here but many have converted to coffe I fear. I think you are missing out by not having tea, maybe you need to treat yourself. 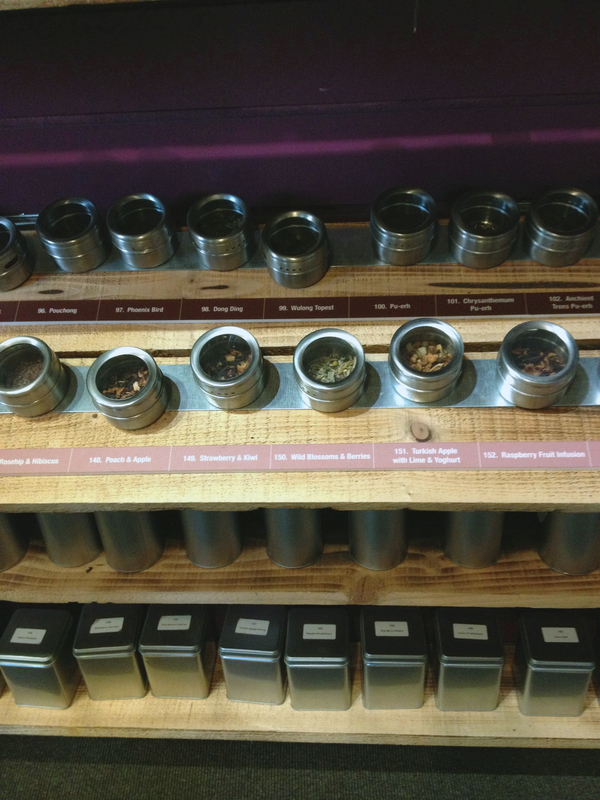 How exciting, then you will have two new items to enhance your tea drinking experience. Don’t forget to post about it so we can see. Oh, I want to make one! Is there a link to the pattern? I am so sorry, I forgot to add the link, I will add it to the post but here it is http://www.ravelry.com/patterns/library/easy-ripple-tea-cosy . I hope you post about it, I would love to see. I love tea cosies even though I don’t drink the stuff. Cafetiere cosies are just not the same, even if i have made many! Isn’t it funny how an item can be so appealing, I am really enjoying making them and trawling for new ideas. I love your tea cozy! I have several cozies I made for my pots. Thank you, have you posted about your tea cosies? I had a look and saw lots of lovely things but couldn’t see any cosies. I would love to see. PS:a while ago, I’ve found a great coffee and tea shop here in Parma, yeap!!! Maybe this is an opportunity for you to enjoy a cup of tea, in a cafe so it won’t interfere with your craft time so much. Enjoy. Thank you my friend. It’s a hard choice, more crafting time or take up tea drinking? I think you must do what suits your taste the best, it is hard to put down your project when you get so engrossed. Thanks. 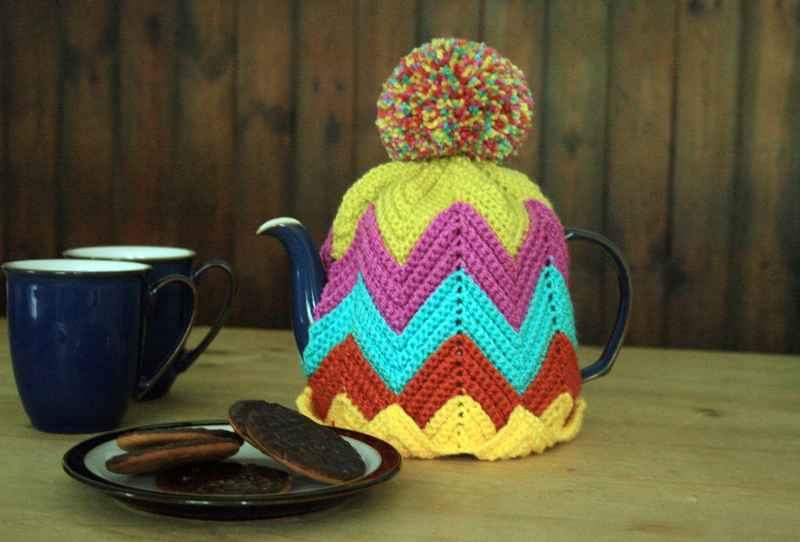 Tea cosies do seem to be back in vogue at the moment, I think that maybe my tea revolution is comming? loving the tea cosy and sure keeping the pot warm.. how exciting to see all those little jars of loose leaves.. yum! It was truly amazing to see all the different teas, I have never seen so many, sad that it has closed. Love it! Love it! Tea and tea coziea are some of my favorite things, although I have yet to crochet one. The pom-pom is great! Thank you, so happy to meet a fellow tea drinker. You have inspired me. I have a book from the library, 100 colourful ripple stitches to crochet by Leonie Morgan. I wanted to play with some of the stitches and now I think I’d like to make a tea cosy. So happy to have inspired you. 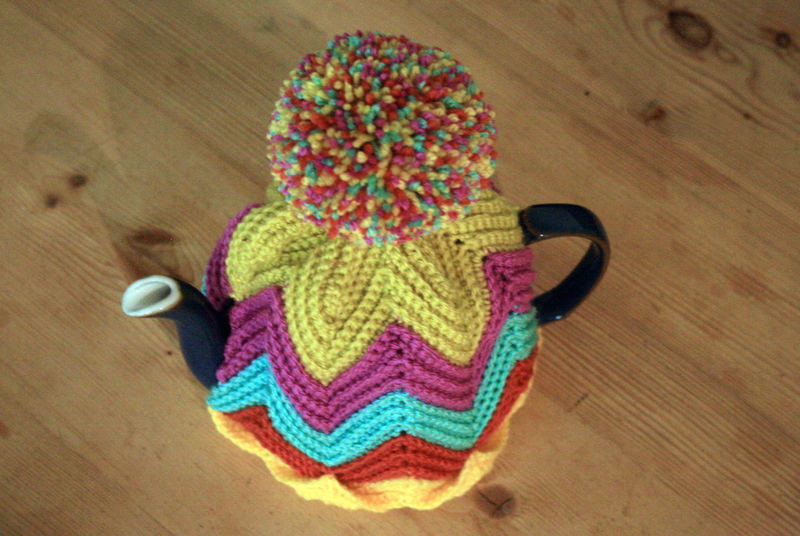 I am really enjoying making tea cosies, they are quick to whip up and so useful too. I love the colors. I love the pompom. I just wish we drank tea at my home. 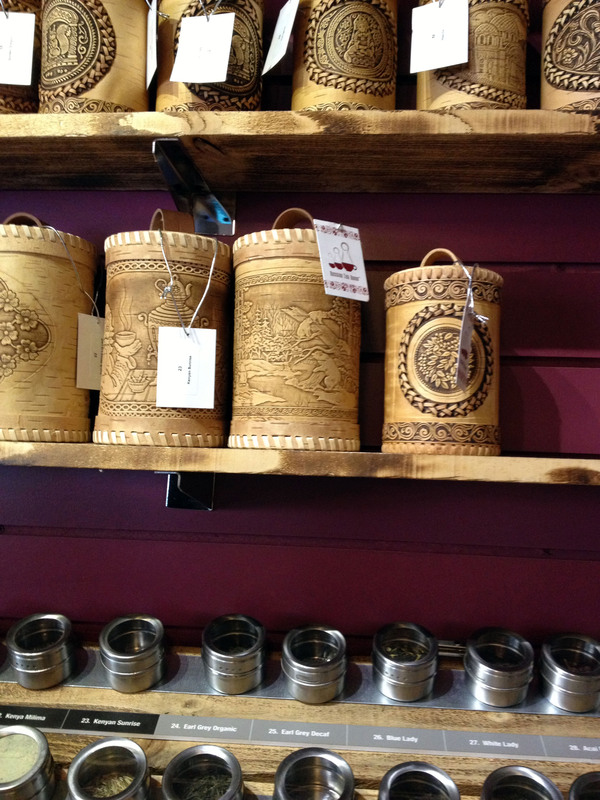 Thanks, you could always make a cosy for your caffetiere. I came across this blog, http://thecornerofknitandtea.com/ , you might enjoy it if you like tea. Thanks for the link, just had a quick look and will definitely re-visit again. The teapot looks lovely, very colourful. Thank you, I will keep topiary in mind for a career change. Perhaps I should try sculpting some animal shapes out of pom poms first though, whatch this space!